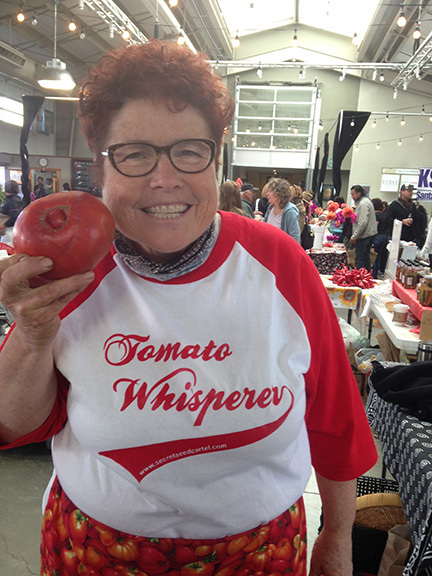 Ok folks, the Tomato Lady (that’s me) has decided to teach a comprehensive course for all the tomato lovers who want to be successful at growing their own tomatoes here in the greater Santa Fe area. Interested? Read on. These hands-on classes will emphasis learning how to grow tomatoes successfully throughout the whole season. Participants will learn how to grow tomatoes from their seeds, what starting mix to use, what soil to transplant in, how to handle the delicate seedlings when transplanting up, how to produce sturdy plants. Lighting systems will be discussed and your seedlings will stay under lights at my farm under my care until time to plant outside when you will take your plants home to plant outside in your garden. All planting materials, seeds, soil, amendments and pots supplied while growing them at the farm. Class participants will get a workbook with printed material added at each class to help them be successful throughout the growing season. Students will get experience with actual planting to gain confidence and will come back to learn how to prune them, how to identify diseases and pests and how to control them. Participants must sign up for all classes at once. Course payable at signup for a total of $150. Class size is limited-10 students max. This takes a commitment. No partial classes. Transplanting up to 2” pots/changing the type of soil, adding amendments for great growth and how to deal with transplant shock and learning how to maintain your plants. Learn about transplanting up to the next stage of growth-up to 4” pots, how to transplant to get the best sturdiest stems, additional amendments you can use and how to maintain your plants. Participants will learn how to transplant their tomato plants out in the garden, how to prepare planting hole and what amendments to add when planting for better growth of tomatoes. Discussion and demo of how to use wall-of-waters and how to set them up properly. After learning how to do all this, students will take home their plants to be planted in their own gardens. Participants will learn how and when to remove wall of waters, how to control leafhoppers, learn about tomato cages-what works and doesn’t work, saving water by mulching, using organic fertilizers, using row cover as protection. Trimming and pruning your tomato plants, the pros and cons of sucker control and how to remove them. Learn to make compost tea. Identifying beginning problems, which organic fungicides and insecticides to use as the season goes on if needed. Participants will learn how to maintain their plants, pruning techniques, harvest techniques, identify tomato diseases and pests and how to control them organically. 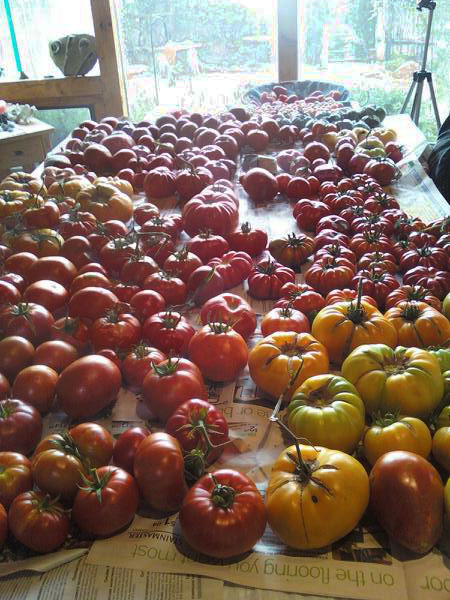 This entry was posted in 'THE TOMATO LADY', CLASSES, general and tagged The Tomato Lady classes, Tomato Growing 101 class, Tomato growing class, Tomato growing in Santa Fe. I highly recommend this class to all tomato lovers! Jannine has all the information you ever wanted and much more and is a wonderful teacher. You will know how to care for your plants in any situation. Have fun with growing your own tomatoes and eating them off the vine and freshly harvested in your kitchen!